66 Landscape Architect and Specifier News When Patrick Cloonan, RLA, completely redesigned and overhauled the back yard of a client's home in Hunting Valley, Ohio, it was similar in some respects to other projects he had done in his 24 years in the landscaping architecture business. But there is one element in it that stands out in his mind, one that lends sort of a "Narnia like" warmth, exuberance and charm to the landscape — a gigantic, manmade tree with huge, sweeping branches, complete with a large swing suspended from one its limbs. Eight years earlier, Cloonan had designed and built a new entryway, including columns and walls, a fireplace and fire pit, two outdoor kitchens, plenty of landscaping, a large waterfall with bridge, and other amenities in the backyard. But the pool area and cabana were untouched. Then just recently, his client opted to remodel these elements as well to complete the backyard. Patrick Cloonan Design Services Inc., based in Willoughby, Ohio, was the landscape architect and construction manager for the job. Cloonan specializes in custom residential and commercial projects. Top The new spa appears to be glass, but is 3" thick acrylic. It has infinity edges on all four sides, and there is a holding tank underneath the pool area that replenishes the spa with warm water. Cloonan also said the pool area has a sophisticated "gutter system," so the warm water from the spa won't comingle with the cool water from the swimming pool, even though it appears that the pool and spa are connected. In line with the "California" look the client wanted, the pool features floating steppingstones. Aside from the acrylic, the spa is lined with custom glass tiles provided by High Tech pools. Part of the pool is also comprised of this same glass material. Bottom Some 4,000 square feet of pavers were used for the patio and pool areas, after the existing 12-year-old swimming pool was demolished and replaced. S & M Landscape Construction, the landscaper, installed all the plants. The cabana next to the pool was also redesigned and rebuilt. 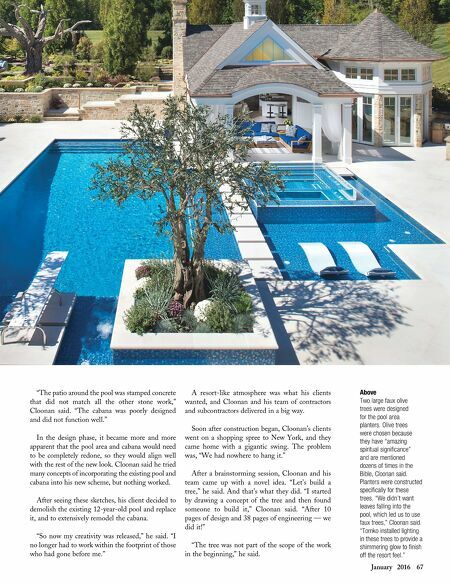 Joe Myers Architects did the design work on the cabana, while Ken Badalamenti of Riviera Construction reconstructed it.